Interested in a garage, storage shed, or any other post frame building? Arrow Buildings is your top source for designing and customizing your structure from frame to finish. Post-frame construction is an engineered wood-frame building system that meets UBC and IBC standards. Arrow works closely with local building inspectors and uses only top-quality contractors. Post-frame buildings feature large, solid sawn posts or laminated columns instead of wood studs, steel framing, or concrete masonry. They transfer loads to the ground or surface-mounted to a concrete pier or masonry foundation. Post-frame structures are more quickly constructed than other kinds of buildings. Because the larger posts and the interlocking frame can handle greater loads than stud-wall construction, fewer structural materials are needed, which saves time and other costs. Also, because posts are spaced farther apart than studs, post-frame buildings feature an exceptionally large wall cavity and provide ample room for insulation, lowering heating and cooling costs through the life of the building. Almost any type of exterior finish may be installed on post-frame buildings, which can be designed to meet the highest standards for quality and aesthetics. Post-frame construction is an energy efficient and economical option for low-rise applications and is now the construction method of choice for any number of residential, commercial, and agricultural projects. Residential – garage, homes, storage shed, recreational vehicle storage, gardening equipment storage, collector car storage, toy storage, workshop, and more. Commercial – business office, warehousing, vehicle storage, retail stores and more. Agriculture – equipment storage, crop storage, animal shelter, equestrian buildings, and more. Post Frame & Floor - Choice of engineered glue lam columns or treated natural wood posts. With proper post support, flooring can be dirt or concrete slab. 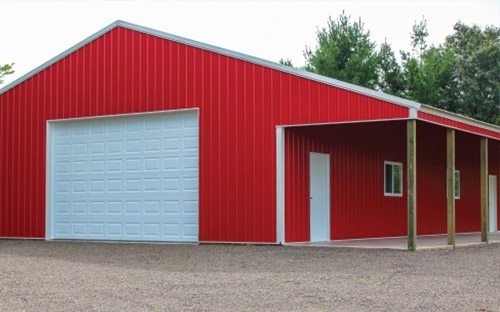 Steel Choices - Long-lasting durable steel available in many colors and options to customize your building. Interior - Can be left unfinished or fully insulated, lined, and finished as desired. Accessories – Gable and eave overhangs, dormers, porches, cupolas, venting, windows, entry and garage door options are available to compliment your structure. Call an Arrow Buildings Representative to discuss your needs and ideas and we will provide you with a FREE estimate.